Happy #mantramonday, Blue Ridge Nation! This Monday we are focusing on a mantra that we have used many times in our @blueridgehemp team: self-care is not selfish, it’s selfless. Many of us don’t offer ourselves much self care because we believe it is selfish to set aside that time. We are told to devote our care and attention to others, our families, and our work or school. We can forget that we are just as deserving of our time and attention as these various realms of life, and in order to have the energy to bring our best selves to our relationships and projects, we need to be giving ourselves love, too! These @cbdsuperfood chocolate and tahini drizzled bananas are a great way to practice a moment of self care. This quick snack is full of nutrients that support your body — tahini can help to balance hormones during the luteal and menstrual phase of your moon cycle, cacao may help to brighten your mood, and bananas are high in fiber and potassium to keep your digestive tract, blood pressure, and bone & muscle strength thriving. Sit down to much on this yummy snack to give yourself a moment of pause and support your physical and emotional wellbeing all in one! Heat saucepan on the stove. Remove from heat and add chocolate coconut oil to melt. 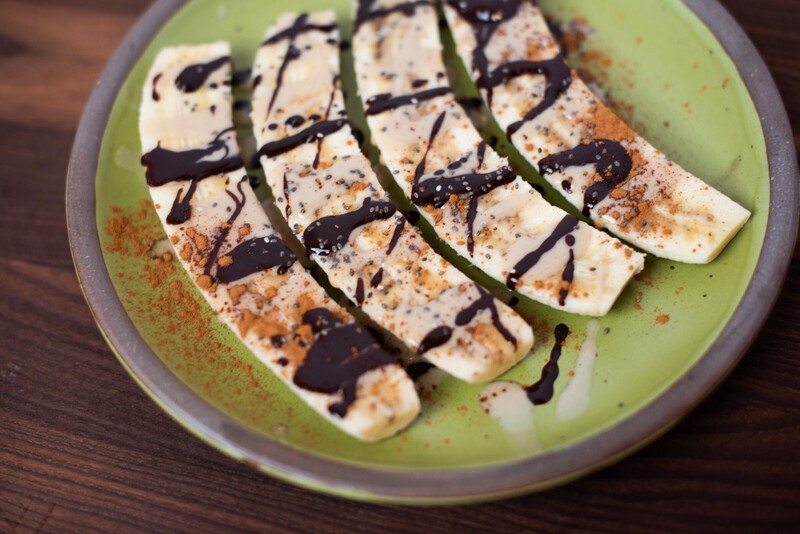 Drizzle chocolate coconut oil onto bananas, and follow with a drizzle of tahini. Sprinkle with chia seeds and cinnamon, and enjoy!